Epigenetics May Provide Relief for Fragile X Syndrome and Intellectual Disorders | What is Epigenetics? Intellectual disabilities affect an individual’s ability to communicate, process information and can severely impact basic life skills of people from all age groups. Many are a result of a genetic mutation and have often had little insight on any cures or treatments. Recent research published in Cell suggests that epigenetics may play a role in alleviating behavioral symptoms and improving neuronal connections. Fragile X Syndrome is the leading cause for intellectual disability on the genetic level and, until recently, seemed untreatable. A new discovery out of Rockefeller University showed that drugs targeted to a process highly implicated in epigenetics called chromatin remodeling may be able to alter the complex signaling pathways in the brain to treat illnesses like Fragile X. 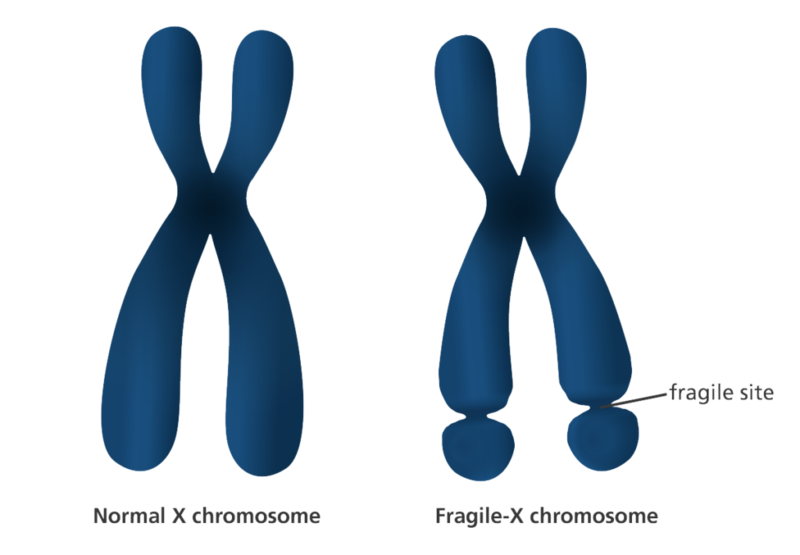 Normal and fragile X chromosomes. Credit: YourGenome.org. Fragile X Syndrome is a rare genetic disorder caused by a mutation in the fragile X mental retardation 1, or FMR1 gene. This gene produces a protein called FMRP, which is responsible for regulating proteins that develop connections between synapses in the brain. Study author and postdoctoral researcher Erica Korb and her team focused on a group of FMRP targets in the brains of mice that encode for transcriptional regulator proteins in order to determine the cause of Fragile X. Korb is part of the Laboratory of Chromatin Biology and Epigenetics, headed by C. David Allis who has made significant contributions to understanding the histone code and identified the first transcription-associated histone, acetyltransferase in 1996. To better understand the complex signaling pathway, Korb’s team first turned to a study conducted in 2011 by colleague Robert Darnell, which concluded that there are hundreds of cell signals associated with FMRP and neural function, and chromatin remodeling proteins present in different types of autism. Normally, FMRP binds to cell signals to inhibit the production of proteins, but the mutation prevents this interaction, which yields an increase in synaptic protein production in the brain. As a result, patients with Fragile X Syndrome typically experience severe intellectual disabilities like speech difficulties, ADD and autism. 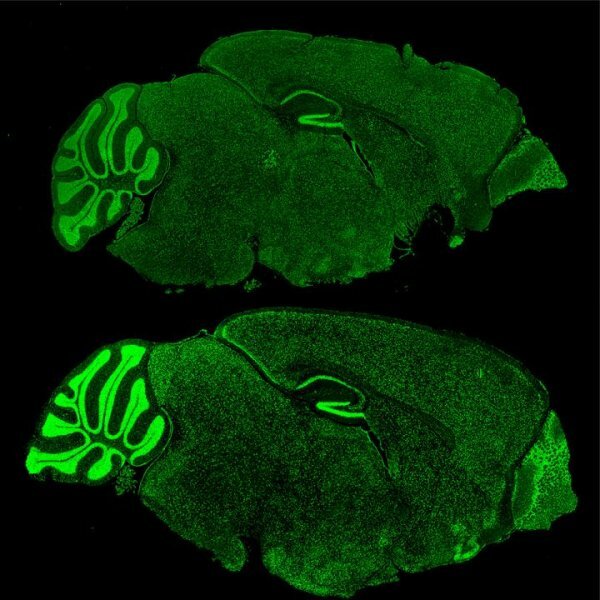 Fragile X Syndrome (bottom) in mouse brains are unable to regulate proteins like Brd4 (green). Credit: Rockefeller University. In this study, they found that even in an absence of FMRP, the mice were still experiencing abnormal gene expression and changes in chromatin regulation throughout, leading to the conclusion that there was still a mechanism that was transmitting signals to restructure chromatin. Korb then shifted to examining the chromatin reading protein BRD4, which is a protein targeted by FRMP and a known protein associated with tumor growth. The research team created cells that contained no FMRP gene and confirmed that its absence resulted in definite epigenetic misregulation. Korb and her colleagues then moved to a drug popular in cancer treatment that inhibits BRD4, and determined that the inhibition of BRD4 was effective in reversing the over-production of synapse proteins, which was an impressive find for Korb. This discovery demonstrates that epigenetic treatments, which have shown promise in cancer and viral treatments, may also make an impact on treating and preventing devastating intellectual disorders like Fragile X and other disorders on the autism spectrum. Korb hopes that her team’s research can open the window to a better understanding of the complex pathways responsible for gene expression and disease development. Source: Korb, Erica et al. (2017). Excess Translation of Epigenetic Regulators Contributes to Fragile X Syndrome and Is Alleviated by Brd4 Inhibition.Cell, 170(6). Reference: Rockefeller University. “Potential new treatment for Fragile X targets one gene to affect many.” ScienceDaily, 3 Nov 2017. Web.